"This is paradise!" shared Noah as the kids and I soaked in the gorgeous, 75 degree rays while taking in the numerous outdoor displays at Laumier Sculpture Park. 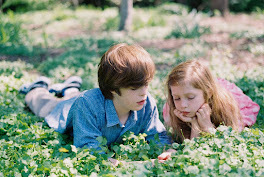 More than 80 works of contemporary art pepper the open fields and wooded areas of the 105 acre park. It was March 15th and the first day of their Spring Break which somehow kids interpret to mean "Yea! I'm on vacation!...So, Mom what do you have planned to keep me occupied for the next 10 days?" Nevertheless, I was up for the challenge and READY with beautiful weather as my cohort. We spent nearly three hours exploring as the kids wondered aloud, "what will we see next?" "Look, Mom! I found a sign of Spring!" Many of the works offer small replicas for those who are sight-impaired to enjoy. They spent no less than 30 minutes skipping rocks. The only way I was able to finally drag them out of the woods was to agree to let them take some of their rock treasures home. Day 2 of Spring Break = Rock painting! By Sunday, the temps had dipped back down to the mid 30s-40's. For anyone not familiar with St. Louis, this would seem unheard of, but I was born here and therefore prepared. My next move to combat the winter blahs was to invite an entourage of kids to our house to play over the course of several days. Although I was outnumbered 4 to 1 and the cooler weather kept me inside coralling a platoon of pint-sized people, I made sure to stock the fridge with an arsenal of kid-friendly snacks. 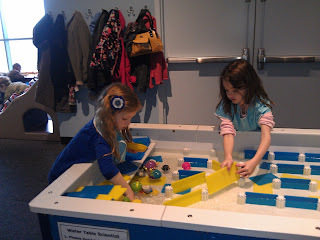 On Wednesday the kids and I ventured out to the St. Louis Science Center with our friends, the Mayos. Michelle and I chose to divide and conqueor. She took the girls to the Discovery Room --a mecca of hands-on interactive exhibits for kids ages 3-7; while I reserved time for the boys to take their love for Legos and computers to a new level with Lego Mindstorm robots. Kids ages 8 and up can work with a teammate to build and program a Lego Mindstorm robot to compete with others. The program is limited to eight and sessions run hourly from 11 am to 3 pm for a nominal fee of $3 per player. The object of the game is to program your robot so that it can rid it's circle of all pegs. The first time out, Noah and Connor's program had their bot clearing their ring with only one peg remaining. They tried tweaking their program with unfavorable results. However, it never seemed to dampen their spirits or desire to keep playing...kids are like that. I need to be more like that. Get caught up and enjoy the process and stop worrying about the result. Linking up their bot to the computer to prepare it for programming. The boys test out their program. Talking through changes they can make to improve performance. 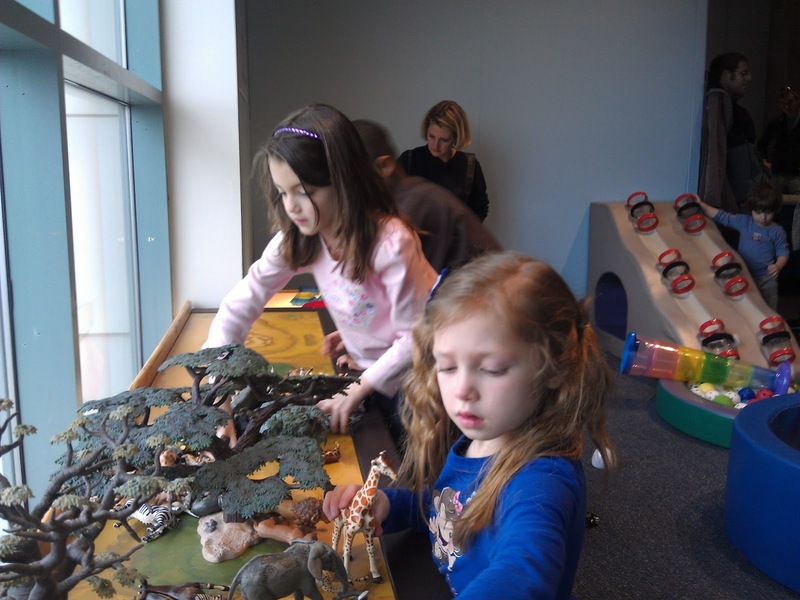 Nat and Ava enjoy the dramatic play area in the Discovery Room. I think both girls were glad that the bugs were behind glass. By Friday night I was in need of some adult conversation and a little fun. We met up with several friends for a margarita and some yummy Mexican fare at Fuzzy's Taco Shop -- known for their baja tacos - topped with feta cheese and special sauce. 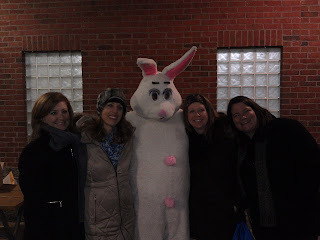 Afterwards, we headed to an "adults only" Easter egg hunt happening at our neighborhood park. Armed with flashlights and long underwear, we had high hopes of winning big and finding one of the four golden ducks hidden throughout the park. Parks & Recreation departments from several areas banned together to fill and hide 5,000 eggs. Although none of us won any money, one of the eggs I found earned me a gift card to Imo's Pizza. Not too shabby. The Moolah Shriners Circus came to town and since Natalie had never been and kid admissions were FREE-- we decided to continue our staycation fun. 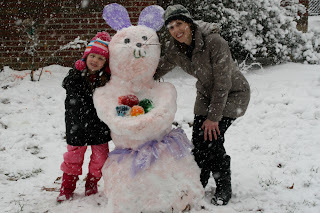 Natalie's favorite part was the contortionist who could fit himself through a tennis racket while Noah's was the dancing bears that performed the "ride the pony" dance move to the beat of "Gangnam Style"
And although Punxsutawney Phil believed otherwise...St. Louis proved him wrong when a snow belt settled in on Sunday, March 24th. In the end we were left with a foot of snow and with it all hope that the kids would return to school on Monday morning. So, when life gives you a winter wonderland a week before Easter...it's best to relax and enjoy the snow...bunny. Sorry to hear your crew has been under the weather. Hopefully everyone is on the mend now. And, def. next year! I saw your picture in the Webster Kirkwood Times! You are famous, now! I know! We would have had a good time together, I'm sure. Happy Easter to you!